Watching my dad go through bankruptcy pushed me even further to detest debt and fixed expenses. The debts and reoccurring payments were an increasing burden during tough times, and were a big contributing factor to him having to close up shop on his farming operation. Since seeing this I realized how easily it is to fall into the “consumerism” trap and the importance of 1) avoiding debt, and 2) limiting my fixed expenses. Since writing “How to Stop Living Paycheck to Paycheck – Passive Income” my family and I’ve been able to breakup our fixed expenses and variable expenses into separate bank accounts. 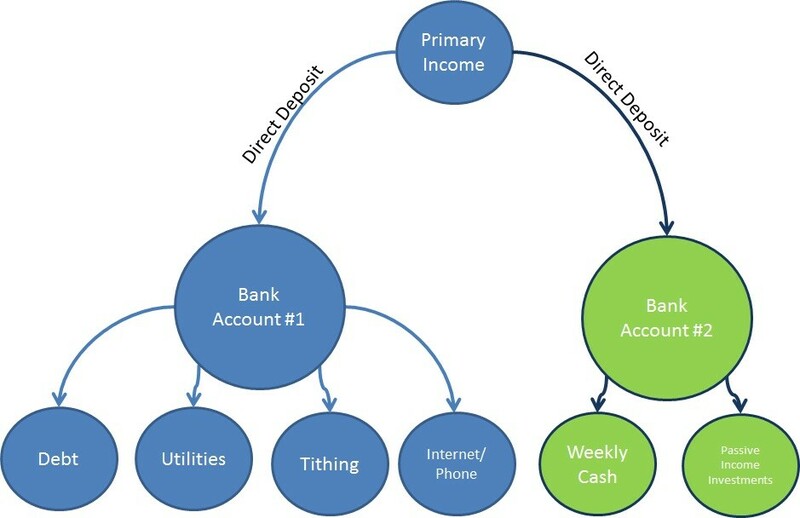 Having a set amount direct deposited to bank account #1, like the above diagram, has helped us know exactly how much our fixed expenses/debts are costing our family. On top of that its helped motivate us to further reduce these expenses, which included switching to Ooma Phone Service. 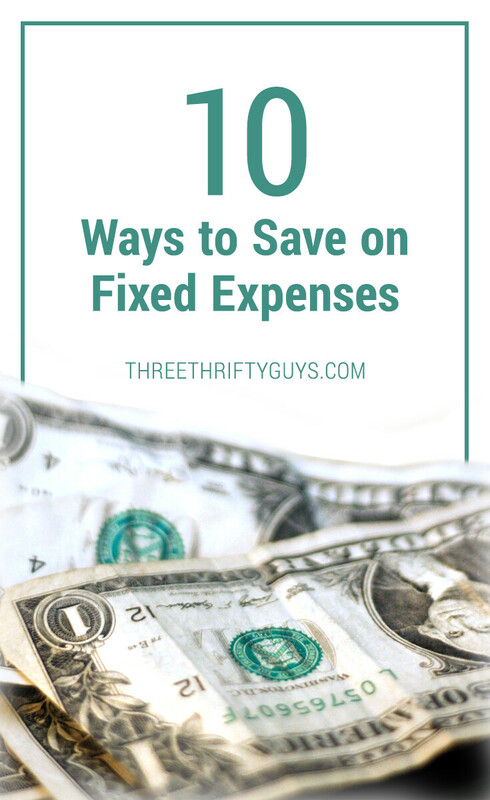 Here are a few tips that have helped me reduce my fixed expenses. Mortgage – if you are paying more than 5% on a 30 year mortgage and have more than 10 years left on your loan, then you’re giving your money to the banks. Look at refinancing now! Rates are still at historic lows, and you need to make every effort to reduce your interest. Right now on bankrate.com 20 and 30 year mortgages are at 4%+. Also consider taking advantage of bi-weekly mortgage payments, which can help you shave off about 7 years from a 30 year mortgage. Loans – be cautious of taking on any new debt. Consider first saving for your large purchases as opposed to going into debt. If you have to go into debt then do everything you can to get out quickly. Also shop around for the best rates, and options too. Every % point is a few more dollars in your family’s pockets. Telephone – don’t be satisfied with the status quo land line. Shop around for your business. A lot of land line companies are offering competitive rates just to keep you from switching to a VOIP provider. If you can leverage VOIP services then consider Ooma, Vonage, or Skype. Cell Phones – just like regular phone providers, cellular companies have been very competitive in recent years, and especially with everyone having smart phones and data plans. If you have to have a smart phone then take a look at Virgin Mobile. They have some great plans starting at just $35/month and all plans include unlimited data, text, email, and web. If you aren’t into having a smart phone, then take a look at pay-as-you-go phones. I used a Tracfone several years ago have had no regrets. Electricity – switching to compact fluorescent bulbs has definitely helped drive down our family’s expenses. In addition, we keep your house at about 78-80 degrees during the summer to help lower our AC expenses during the summer (except when company’s here! :) ). We also keep our shades drawn during the summer to keep the UV heat out. Every little bit helps! Water – couple of water conservation tips we use are, 1) utilize your washing machine’s speed cycle, 2) limit watering your grass to 3 times week during the summer & utilizing fertilizer to help alleviate the need to water, 3) fill the sink once to alleviate using running water while washing your dishes by hand. Natural Gas – we don’t use a lot of natural gas, but our primary needs for it are for heating our home. A few tips to help lower your natural gas expenses are 1) lower your thermostat during the winter, 2) open the shades during the winter to let UV heat in, 3) shutoff your pilot light on your fireplace when you aren’t using it. Insurance – consider raising your insurance deductibles on your older vehicles, since their value isn’t as much as when you first bought them. Garbage Hauling – when I first moved into my house I thought all garbage services were the same. Boy was I wrong! About 3 years ago I found out that neighbors were paying about $30 less every 3 months than me. In also shopping around for garbage services I found three other companies that were offering their services in our area. You may be surprised how much you can save on this fixed expense by spending a few minutes shopping around. TV – consider switching providers from cable to satellite. Recently, DIRECTV lost a lot of customers due to the whole VIACOM dispute. They’ve recently got really aggressive on their pricing and are eager to gain back customers. The other alternative is to completely cut cable/satellite from your fixed expenses. A lot of families are choosing to go this route and especially with how easy it is to stream shows & movies over Netflix or Amazon Prime Instant Videos. In addition, something that has helped even our fixed expenses is to switch all of our utility bills to “even payment plans”. The plans are calculated based on the past year’s usage * current rates. It makes it easy to have the same amount come out of your account each month. Overall, if I could offer one piece of advice for reducing fixed expenses would be to switch your mindset. You have to be of the mind that you “DETEST” it! Hate it! Debt and fixed expenses are like a disease. They are what you and your family are committed to having to pay regardless of whether you have job or lose it. With how appealing marketers portray “consumerism” it’s as if we’ve all fallen prey to this vast conspiracy to get people to think they need things. Detest debt and fixed expenses and your life will feel a lot more freeing. All awesome ideas Charlie! It’s really about doing a deep dive into a spending plan and then cutting away. Actually, for room heating purpose I have installed a programmable thermostat. But never compared the expenses. Going from 2 cars to 1 is a great way to cut fixed expenses. Not only the car payment but the insurance, gas, tag, repairs etc. I know it’s not possible for many, but if you can swing it, it will swing you into a more positive cash flow! Sorry – I wasn’t clear enough on my first comment We currently do not pay PMI as we put over 20% down when we purchased eight years ago. Because the value of our home has decreased about 30%, we are currently around 90% LTV. We could take money out of savings and do a principal reduction and then refi but this does make me nervous. Yes, we’ve considered selling too. We would do that only if we didn’t have to bring money to the table. When we sold our first house we made six figures on it – it’s depressing to think we will make nothing or very little if we sell in this market. Mandi – that is a tough question, since you are in a “non-ideal” position. Sounds like you’ve got a little bit in savings and don’t want to give the security blanket up to remove your PMI. If I were you I’d try and quantify what the PMI is costing me vs how much I’d earn off the interest in a money market account. So let’s say you need $20,000 to get your loan-to-value (LTV) below 80%. Applying $20,000 to paydown your principle to below 80%, which I’d estimate is would cost about $75/month. In my mind this comparison is an easy decision, but having that security of having a emergency fund is a big pyschological protector. At the end of the day it is your family’s decision. Have you considered selling your house and buying a cheaper home? Really great list guys! And good point about mortgages. This may be a once in our lifetime opportunity to score such a low mortgage interest rate. Time to act. I’ve looked into refis a bit. We refied under HARP when it first came out and our rate is right around 5% (30yrfixed). Since our county was distressed during the height of the housing downfall, our LTV is unfortunately at 90% and I believe HARP is one and done. We don’t want to refi and spend our savings on mortgage insurance due to an LTV over 80%. Any suggestions? Been doing some of these ways to save money on expenses at home and it’s certainly effective! Tiffany G. Richert, Proponent of Simple Living!